With a single mono-body assembly, Rotarex’ new Flowcal and Ducal integrated valves make calibration operations safer, easier and more accurate. http://www.rotarex.com – Rotarex SA introduced Flowcal and Ducal, the first integrated valves for calibration gas applications. Designed for use in sensitive lab environments, they are fully compatible with all non-corrosive pure calibration gases as well as gas mixtures that contain corrosive elements. By integrating multiple functions into a single unit, the need for separate components and connectors is eliminated. This reduces leak points, improving safety and accuracy. Ease of operation is assured as the user can simply open the cylinder and choose from preset ranges. Plus, with a compact size, Flowcal and Ducal are easier to transport and store. Flowcal integrates a ¼ turn shut off valve with a pressure regulator, flow selector, pressure gauge, filling port and safety relief valve. Installed directly on a cylinder, it reduces pressure and enables flow management. It is the first stainless steel integrated valve that is fully compatible for aggressive and corrosive gas mixes. Flowcal is compact and lightweight, weighing just 1.05kg/2lb, and is ideal for transportable applications. Accurate flow regulation is assured through a dial flow selector with 11 calibrated orifices, piston technology with an O-ring pressure regulator and a ¼ turn valve hand wheel that enables a direct seal diaphragm shut-off valve. This innovative, all-in-one system, requires little maintenance over its long guaranteed lifetime. It has been tested in accordance with ISO 22435 – ISO 10297. 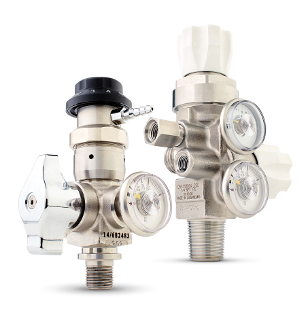 Ducal is the first stainless steel integrated valve and pressure regulator that ensures compatibility with calibration gas. It is highly accurate, due to a high precision pressure regulator that delivers a very low Irregularity Factory (only 7%). Ducal’s dual-stage metallic diaphragm regulator, regulator hand wheel and diaphragm shut-off valve hand wheel allow highly precise calibration gas regulation with continuous flow. Continuous adjustment allows Ducal to operate with all calibration gas mixtures. Connecting directly, it is available for most taper and parallel threaded cylinders. Requiring little maintenance over its long guaranteed lifetime, Ducal has been tested in accordance with ISO 22435 – ISO 10297. Flowcal and Ducal are produced with Rotarex’ 3 Star Quality process. They are part of Rotarex’ new range of calibration valves with pressure regulators. Learn more about Ducal and Flowcal and Rotarex’ range of equipment for calibration gas mixtures http://www.rotarex.com/business-units/ceodeux. Rotarex - http://www.rotarex.com - designs and manufactures a wide range of very high quality gas control products that deliver peak performance, giving sellers, users or installers of gas equipment confidence that their projects will achieve better success. Developing industry-leading innovation expertise during its 90-year history, the company counts over 100 patents in its portfolio. With ISO certified manufacturing standards and unmatched source through production quality control, Rotarex products perform better, require less maintenance and have a longer life. Rotarex offers the widest range of control products and systems for all major gas applications.